A lively and very readable collection; O'Brien has returned to many of her earlier themes, including dislocation - as she seeks to capture the precise moment of an event, its fulcrum. There are poems of heart and hearth and human relationships, familial, sexual and historical: a father neglecting to teach his young daughter to swim, the trapped girls of The Chinese Chest and poems of nature; often as closely concerned with the nature of man as the countryside they describe. Many of these poems, though serious in intent, are dealt with in a lighthearted and often witty manner, exploring a fascination with the ways of the world and its moral contradictions. Jean O'Brien is a Dubliner now living in the Midlands. Her work is widely published in magazines and journals. She has published two collections of poetry, The Shadow Keeper (Salmon, 1997) and Dangerous Dresses (2005). She read for an M.Phil. in Creative Writing from Trinity College and facilitates creative writing classes for venues as diverse as the Irish Writers' Centre, Dublin City Council and various County Councils and in Mountjoy, Limerick and the Midlands Prisons. She was Writer-in-Residence for Co. Laois in 2005. She was last year's recipient of the Fish International Poetry Award. also in 2008 she was commissioned to write a poem for the Oxfam Calendar. Her poetry was described by Fiona Sampson writing in the Irish Times as ... "effortless writing, graceful and exact as any pirouette in its insight". on-going stories running verso recto. IN JEAN O'BRIEN'S third collection of poetry Lovely Legs there's a very telling line in the poem Photographing Air . "Things are not what they seem," O'Brien writes. And in a book with such a breezy title, bright cover and light tone throughout there's a much more serious and complex undercurrent at work. O'Brien's father appears in more than half a dozen poems. He is the one waking O'Brien's "younger me" to the news of her mother's death in When Childhood Broke . She passes his parish when lamenting her departure from Dublin, and he is the one who populates her memories and dreams. "The dead visit me in dreams", she writes in Scandinavian Dream . The wonder and strangeness of finding oneself in "foreign fields" has created a new imaginative space for O'Brien's moving lyrics. Her imagery can be memorable, as in Masks , where "a man stands in a field wearing a mantle / of bees", but darkness hovers throughout. Her mother's gold band tightens "its golden grip" on her and a poem to the poet's daughter suggests "the kernel of death / sits under her skin". "Thinking of lost summers", the past is a central theme of the collection and culminates in the moving piece Before . The poems in Lovely Legs are like "the flickering scenes we scrutinise / in the darkened room" of the final poem. O'Brien has managed to make an effecting collage of images and memories with a tone of both pathos and resilience as she tells us, "I touch the wound and walk". Jean O'Brien's accomplishments extend from this third collection of her poems to her role as writer-in-residence for Co Laois and as facilitator for creative writing classes in prisons and elsewhere. The intensity of feeling, even while restrained by the poet's attention to significant imagery, gives these poems strength, whether reflecting on the loss of her mother and father or recalling events which reveal how observant she was in childhood, a gift that serves her well as a poet. "Once I saw a cow nudging an inert lump of brown; moaning low she fussed the fretted circling the still calf until it stirred, moving its nut-brown just born head..."
Many more poems carry ironic undercurrents, generated by everything from social inequalities to bad weather. These witty, compassionate poems are rewarding, though some will find the typographical errors distracting. 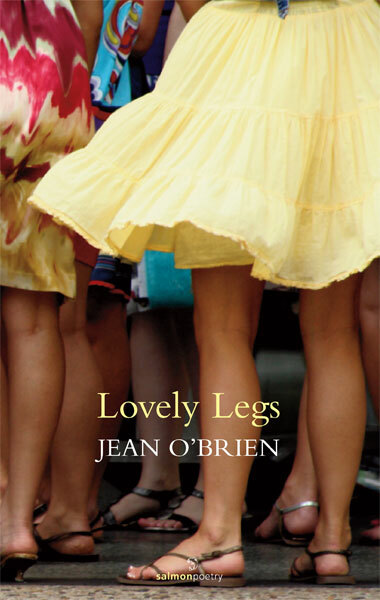 Lovely Legs by Jean O'Brien [is a book] in which the faraway promises of jet-trails are constrained by the domesticity of skylight frames. A lively, readable collection concerned with the intricacies of relationships and the many moral contradictions of society, Lovely Legs follows the arcs of 'lives on a fulcrum', honing in repeatedly on moments of change and realisation. Bee poems such as 'Masks', which opens the collection, make clear that the book's presiding deity is Plath, though O'Brien successfully resists the kind of easy mimicry which might have compromised her own perspective. Poems here discuss femininity and children, but they are all very clearly in O'Brien's voice, a seemingly carefree lilt which nonetheless exudes complexity and depth. Old stories of 'hope and romance' dissolve into poems that actively resist (and sometimes ridicule) the past, while other pieces here lean heavily on popular culture such as The Simpsons or the word soup of 'magnetic poetry' which clings to refrigerator doors across the country. we sense it just below the surface. It is only in the lyric, in the poetic rush, that true connections can actually occur. Poetry is an interactive art, one where ' coded messages are posted / in limited language', and unpacking the layers of meaning in these communiqués is part of the pleaure of this dense book. O'Brien's verse - like her bees - is 'buzzing and busy'. Her word of 'flat, broad horizons' is one seen 'with compound eyes', and her warm response to Paula Meehan's poetry is equally applicable to her own; amid all the 'noise of traffic', the 'clang of tram bells', there is also 'the brightening hum of her words' which, 'like a modern day Angelus / calls us home'.